A pair of projects this summer on West Main Avenue and Division Street will enhance pedestrian safety, increase on-street parking and add new amenities, like planters and seating. One of the improvement projects got underway earlier this month at the intersection of Main and Division. The city is spending $452,000 to create curb extensions at the intersection, which will shorten crossing distances and help slow vehicles through the area as a safety measure. The project also involves installation of stormwater facilities, new sidewalks and planters. The planters will help guard against pedestrians wandering into traffic in an area of popular nightspots, said Julie Happy, city spokeswoman. The city has been working with businesses throughout the job. “Everything is going well,” Happy said. After that work is completed by midsummer, the second project along Main Avenue will get started from Bernard to Pine streets. The center lane on Main is being converted for angle parking between Browne and Division streets. That one-block corridor has become increasingly popular as a destination in the mixed-use neighborhood. An island with planters will be installed at Browne to mark the changed environment. It will be accompanied by a midblock pedestrian crossing with planters and seating in the middle of Main between Browne and Division. Adjacent property owners are committed to maintaining the planters. Additionally, angle parking will be placed on the north side of Main from Bernard to Browne and Division to Pine streets. The change will create 21 new on-street parking slots and eight new motorcycle parking slots. It will double on-street parking in the block from Browne to Division, according to a briefing paper from the city. The $171,000 job is considered a pilot project for the pedestrian-oriented environment. Funding comes from city utilities, the street fund, parking revenue and private contributions. Completion is expected by late summer. 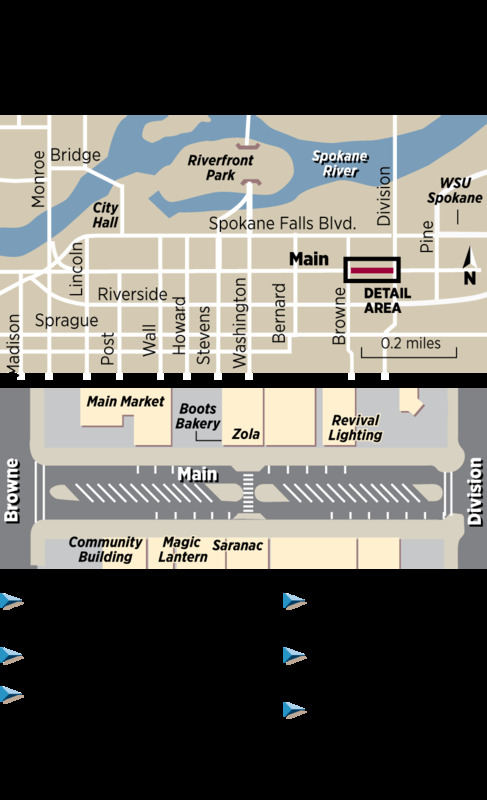 Next year, the state Department of Transportation is planning to repave Browne and Division.